As a working adult, handbag is one of my staple accessories to work, and I usually prefer shoulder bag for the room, or sling bags for the hands-free convenience. However, I tend to fill up my bag too much, and at sometimes it really feels like I am a carrying a kitchen sink around, especially when I have lunchbox and my water bottle together. So one day, after seeing my friends’ posts of this backpack, I was hooked! So, I got myself one from Shopbob, it only took 4 days to reach me from the USA 😀 I love express shipping, especially when I can’t wait to receive my purchase! The wraparound zip opens to one main compartment & laptop sleeve, and it has a front pocket and 2 sides pocket. There weren’t many color choices, but I managed to pick this nice peach pink instead of a yellow. Since it’s meant to be used often and bashed around, I tried to pick a color that’s more dirt resistant. This backpack has only 1 large compartment and a sleeve for tablet or laptop, however, the sleeve is big enough for a tablet but not a 14″ laptop. It comes with a soft foam that I do not bother to remove, I like it being there to support the bag structure. For the main compartment, it’s big enough for a 15″ notebook, it is roomy and has more capacity than all my other handbags. 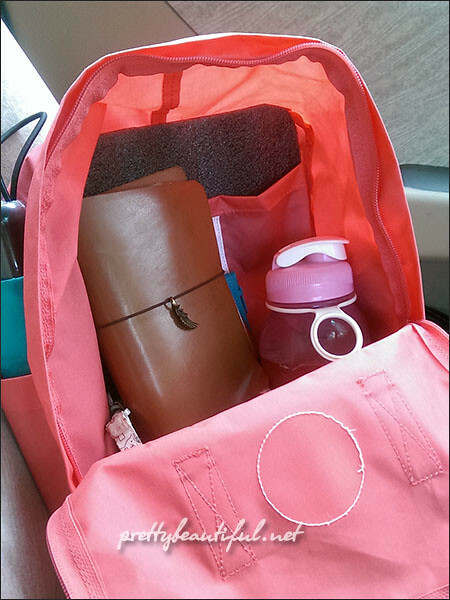 My daily staples in my work bag is my notebook, wallet, a 1L water bottle, accessories bag. 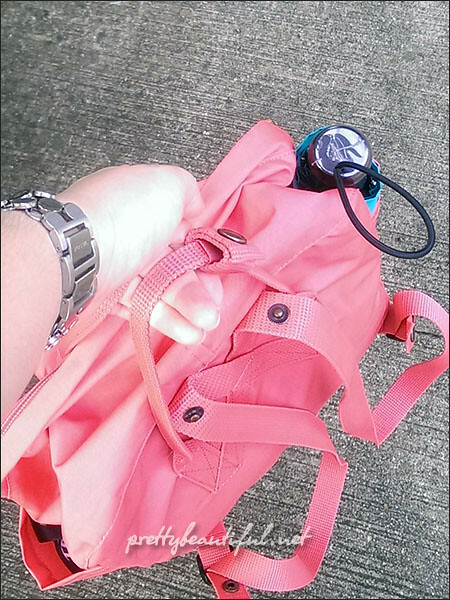 The side pocket is big enough to house a small umbrella but not really a water bottle. Since it’s deep enough, I have my car keys and office access card in there too. Another way to wear it is to button up the top handles and carry it as a handbag. I don’t prefer this way as I prefer the hands-free freedom. As a new user, I am really loving this bag! I love how lightweight it is and roomy enough for everything. Although sometimes it clashes with my outfit, but I can’t really complain for the convenience it gives me. What’s a better than a backpack with daily walk, crossing roads, and lots of stash in the bag? 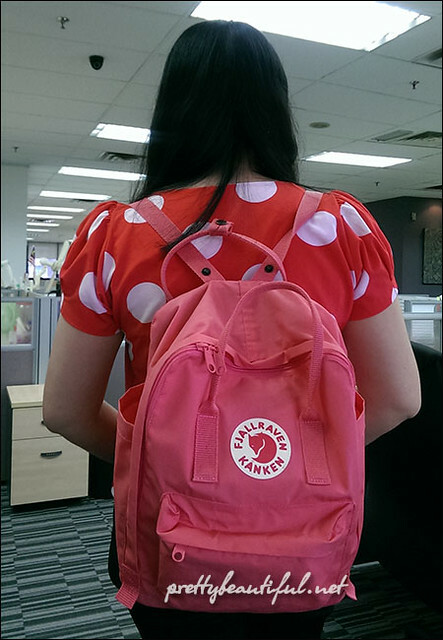 It’s a nice peach-salmon color, and the right size for a day bag, or an overnight. However, the downside, (other than the unpronounceable name) – is probably the same with all other backpacks – the lack of compartments. 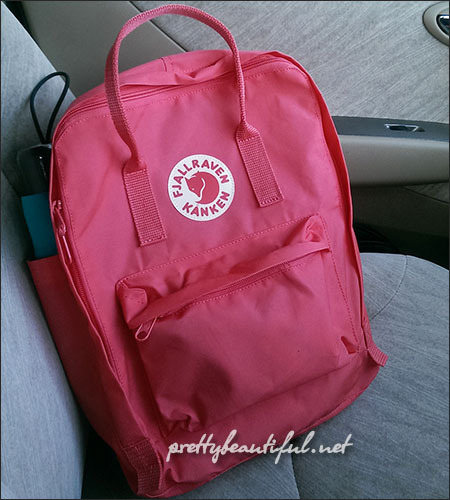 I would love a backpack with small compartments on the interior so there’s more room for small items! As this is a nylon bag, it’s light and only weighs about 300g. I can see why it is so popular, it won’t kill your back just because it’s so light. And the vibrant colors are something hard to be missed. I can forsee that this bag will probably have a very long lifespan if it doesn’t go missing or get stolen. I got mine from Shopbob, the trick to more saving is – wait for the 20% sales! p/s: The badge of this bag is reflective too! It seems like a good one indeed. Love the color and the pockets are just fine. Julie recently posted..Do Eyelashes Grow Back After They’ve Fallen Out? indeed! not to mention the convenience! HOW ARE YOU??? was able to squeeze in reading blog posts while I take calls! Can you please give the link to the specific bottle? I’ve been trying for ages to find one that fits in my kanken!